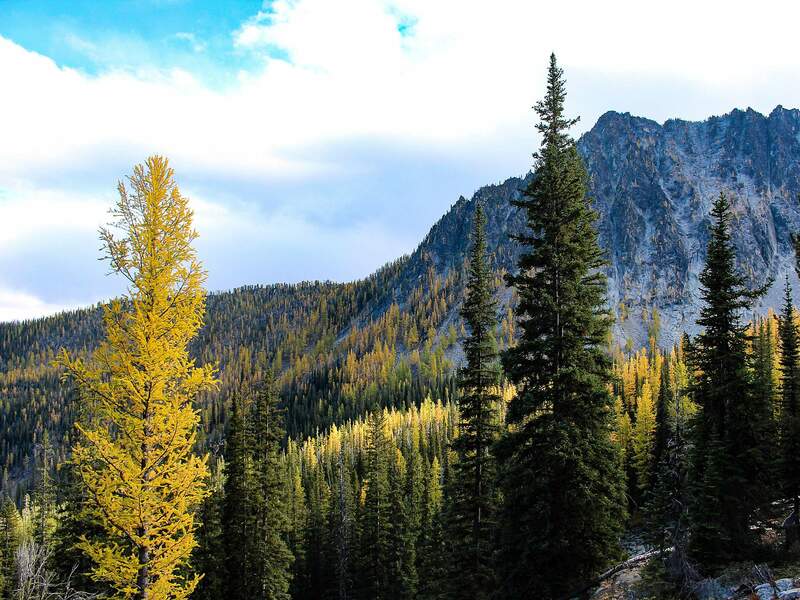 Subalpine larch trees change color in a view from Kangaroo Pass in Washington state in 2014. Larch trees are a deciduous conifer. In the fall, their soft needles turn golden and are shed. There are numerous recreation spots near Leavenworth, Wash., including camping and hiking along Icicle Creek, just outside of town. Also, the wheelchair-accessible 1-mile Icicle Creek Nature Trail is a great spot to view wildlife or take a leisurely stroll. Western larch trees are seen in 2016 along Interstate 90 in western Montana, near the Dena Mora Rest Area about 5 miles east of Lookout Pass at the Montana-Idaho border. 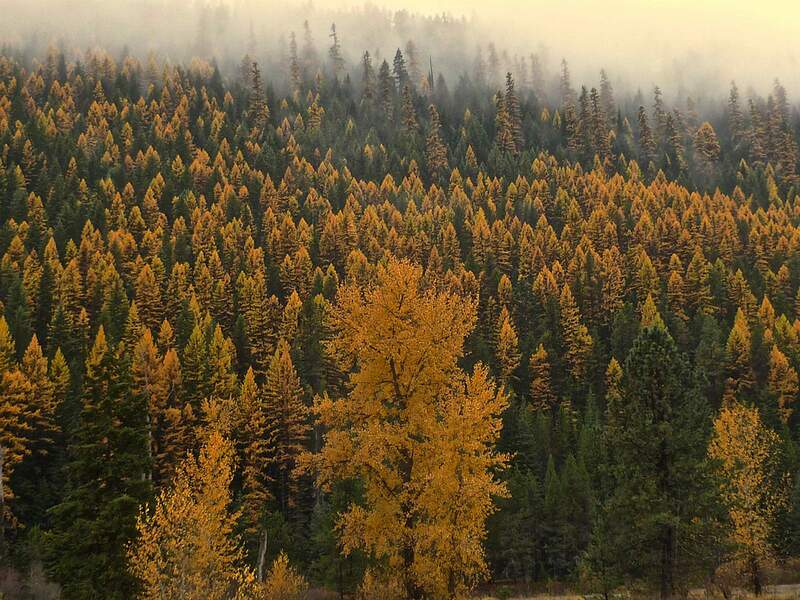 You can spot the gold of the larch trees high on the eastern and northern Cascades in Washington. But to really see them, to feel their softness and breathe in their scent, you must hike. Up. And up some more. 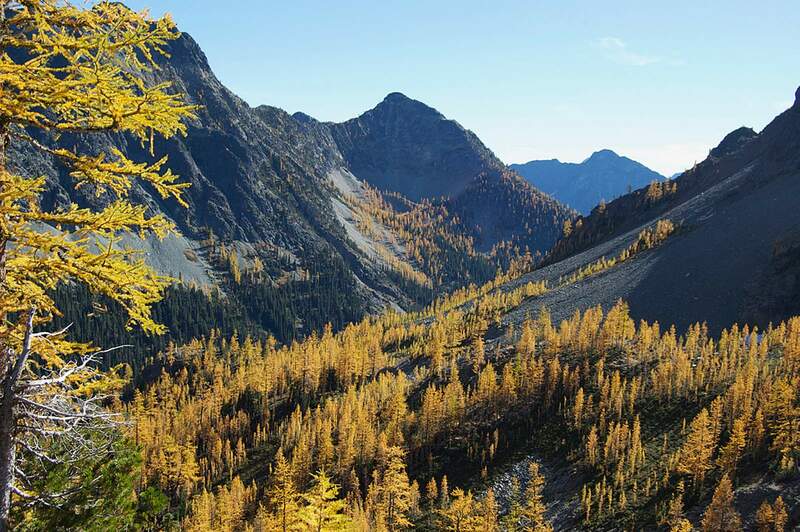 The western larch grow from 1,600 to 7,000 feet, and the alpine larch can be found above 5,200 feet in the north Cascades and above 6,000 feet a bit to the south. It was worth it, despite our overly ambitious journey that included a rainy drive from Seattle over Stevens Pass to the Okanogan-Wenatchee National Forest near Lake Chelan, a late start on the trail and unexpected snowfall. Amy McMillin stops to feel the incredibly soft needles of a larch tree along the Crater Lakes trail in north-central Washington in October 2017. 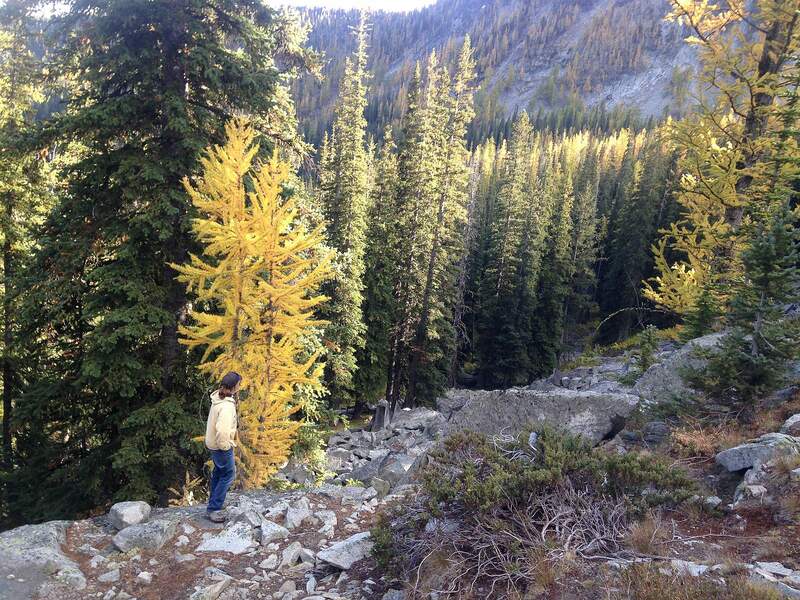 The western larch grow up to nearly 200 feet in height; the alpine larch averages 40 to 50 feet tall. The larch tree is a deciduous conifer – it looks like an evergreen in the summer and it has cones, but its needles turn yellow and fall off in autumn. The western larch grows on the east side of the Cascades from Oregon to southern British Columbia, Canada, as well as in the mountains of northeast Washington and Oregon, northern Idaho and western Montana. The alpine larch grows at higher elevations in the northern Cascades and northern Rockies of North America. There are other varieties as well – for example, the Siberian larch in Russia and the tamarack or American larch in the northern Midwest and eastern U.S. and Canada. The Pacific Northwest, of course, is a wonder of color in the fall. But to include a larch hike adds another dimension. He recommends several hikes off State Highway 20 (Heather-Maple Pass Loop, Cutthroat Pass and Kangaroo Pass) and in the Enchantments in the Alpine Lake Wilderness (Esmeralda Basin, Ingall’s Lake and Long’s Pass) to see the alpine larch. In the Enchantments, about 15 miles southwest of Leavenworth, you can see both varieties. Larch trees dot the mountainsides along the Crater Lakes trail off State Highway 153 west of Methow, Wash., in October 2017. It requires a hike to get a close look at the trees, which grow at elevations above 1,600 feet for the western larch and above 5,200 feet for the alpine larch. How to tell them apart? Western larch needles are three-sided and the cones are on short stalks, while alpine larch needles are four-sided and the cones are nearly stalkless, according to the Northwest Conifers website. Details of Hinckley’s recommended hikes can be found on the Washington Trails Association website, which offers its own suggestions. The ranger station of North Cascades National Park and other state and national forest offices can also provide information. Some areas, including much in the area where we hiked a year ago, have been closed because of wildfires, so be sure to check the latest information. The larches are cold tolerant because they are deciduous, and they are fire resistant because of their thick bark, Hinckley said. But like all species, they are affected by climate change that has led to more frequent, intense and extensive wildfires and changes in snowpack formation. Glorious colorWe hiked the first weekend of October 2017 – and found some beautiful stands of golden larches. Likely western larches, but I hadn’t learned about the differences before the hike – in fact I knew little about these larch trees that my daughter wanted me to see. The color season, as everywhere, is dependent on annual conditions and generally is good for a few weekends. Hinckley said the alpine larch near and above Washington Pass usually are the first to show color, anywhere from a few days to a couple of weeks earlier. The sun was shining on the east side of the Cascades as we made our way through Leavenworth and Wenatchee and headed north on U.S. Highway 97, past the southern tip of Lake Chelan and onto Washington Highway 153. 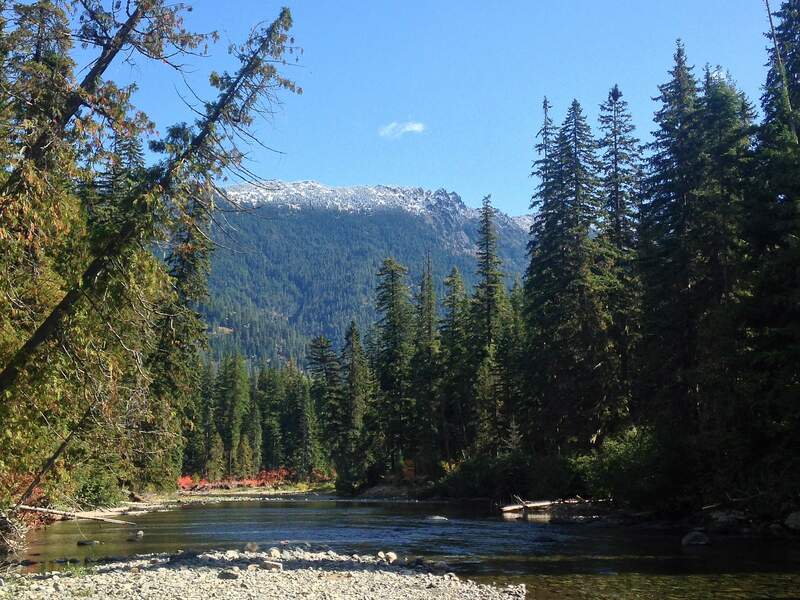 The trailhead was about two hours from Leavenworth, which is about 2½ hours from Seattle. So, we started up the Crater Lakes trail about noon. A slight dusting of snow remains on the rocks as the sun reappears to highlight the golden larch trees in October 2017 along the Crater Lakes trail in the Okanogan-Wenatchee National Forest. 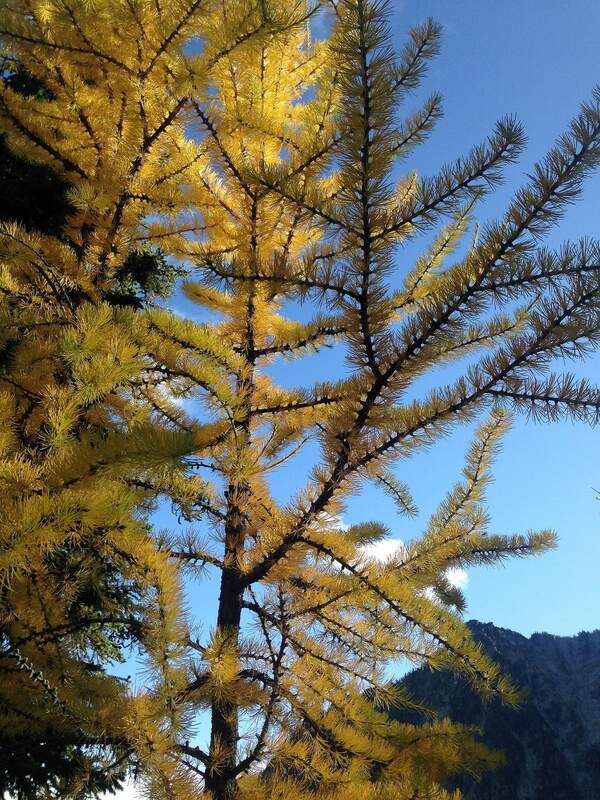 The larch trees are a deciduous conifer, shedding their needles each fall. The forest was peaceful and quiet, and the first mile or so went fairly quickly. But then it got steeper (as expected) and chilly as the clouds moved in. Then, it began to snow. I pulled out my hooded jacket and carried on, realizing that my mountaineering daughter had overestimated my hiking abilities with an 8.6-mile round-trip trail and 2,200 feet of elevation gain. Still, we were determined to reach a place where we could touch the larch trees. And we did. And the sun returned (after about an hour of steady, light snowfall). We ate our lunch on a rocky outcrop and took in a hillside covered in sun-drenched gold. My daughter scouted ahead a bit – Crater Lakes were somewhere about a half-mile farther, we estimated, but uphill on an increasingly rocky trail of course, so we decided to head down to be off the trail and back to the main road by dark. Wise decision. We still had about a two-hour drive back to our B&B in Leavenworth but phoned ahead to let them know we would be late. We checked in and hastily returned to town for food. Dining in LeavenworthAlthough Leavenworth is a resort town and we checked restaurant times online, the German restaurant that claimed to be open until 10 p.m. had apparently closed early. But Icicle Brewing Co. was open, so we were able to grab a beer – a delicious Dark Persuasion, a dark chocolate coconut brew, and something else that was good but less memorable. The Ducks & Drakes sports bar also was open, so we were able to get some wings and other snacks. 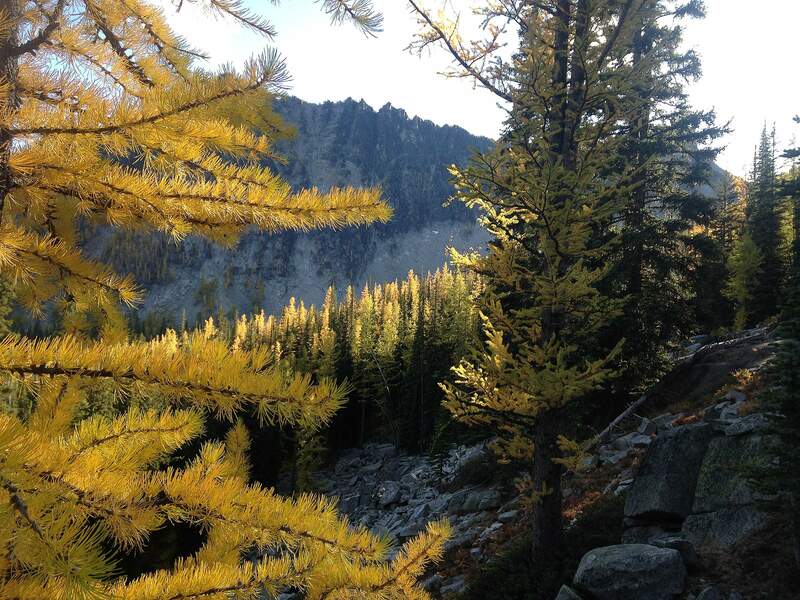 The larch trees on the east side of the Cascades turn a brilliant gold in autumn and shed their soft needles. Western larch live for 300 to 500 years, and the oldest on record is 920 years. The alpine larch live 400 to 500 years, and the oldest on record – in Kananaskis, Alberta – is 1,943 years old, according to Tom Hinckley, professor emeritus at the University of Washington. Leavenworth is a good place to stay for a larch adventure, but I would highly recommend staying there a couple of days so you can hike earlier in the day – and get back to the Bavarian-themed town in time to enjoy some brats or a wine tasting. We did spend some time in town the day after our hike before driving back to Seattle. Interestingly, we tasted wine from years when smoke from wildfires affected the grapes versus non-fire years. We preferred the earthier taste of the “smoky wine”; the region had a smoky year this season because of wildfires in Washington and Canada. There’s plenty of places to stay in Leavenworth or the region. I would have heartily recommended the Autumn Pond Bed and Breakfast, but it seems it has closed. That’s unfortunate as the breakfast was by far the best I’ve ever had at a B&B. I won’t tease you with the details. We also stopped at one of the many fruit stands in the region to buy fresh apples for the drive back to Seattle, during which we gazed at the golden larches high on the mountainsides. Best drive from Seattle to view western larch: Interstate 90 east to State Highway 970 to U.S. 97 and back west on U.S. Highway 2.Best drive for alpine larch: State Highway 20 through North Cascades National Park and over Washington Pass.Hikes: Details on the Washington Trails Association website – www.wta.org. Okanogan-Wenatchee National Forest: www.fs.usda.gov/okawen.North Cascades National Park: www.nps.gov/noca/index.htm.